The etiology of CLP is very complex, because of congenital anomalies that are associated with it. CLP is polygenic and multifactorial involving both genetic and environmental influences. The etiological factors include heredity, consanguinity, fetal environment, demographic factors, and other factors such as drugs, vitamins, alcohol consumption, smoking, infections, and diet. Among all these etiologies, consanguinity is an important factor. According to Dorland's Medical Dictionary, the word “consanguinity” means blood relationship or kinship. 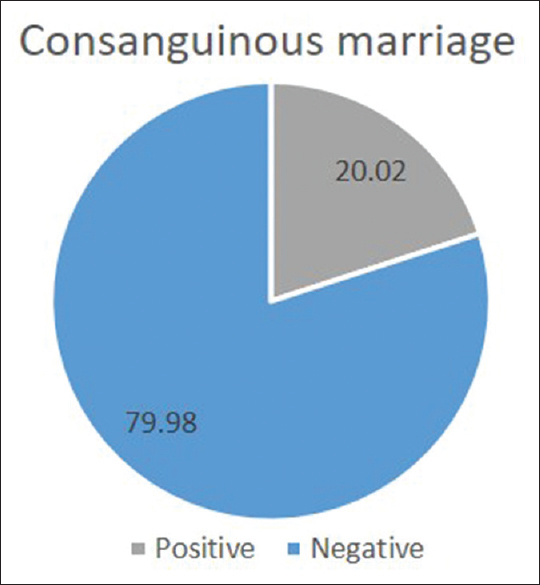 Sah and Powar reported that consanguineous marriage was noted in 48.9% of parents. In a Brazilian study by Aquino et al., the authors stated that CLP (unilateral or bilateral) was more frequent in the group with a history of first-degree consanguinity, with males predominated. Although there is an extensive literature on the overall spectrum of CLP, there is a lack of information of the same in people born to consanguineous marriages in India. Hence, the present study was an effort to study the spectrum of CLP in people born to consanguineous marriages. Associations of clefts, in these patients born to consanguineous parents, with different variables were also studied. This retrospective study was done at GSR Institute of Craniofacial Surgery, a very high-volume cleft center at Hyderabad, India, after the Institutional Ethical Clearance was taken from Hyderabad Cleft Foundation. Principles outlined in the Declaration of Helsinki were strictly followed during data collection. Medical records of 18,242 cleft patients who came for the treatment of CL and/or CP in the past 13 years were physically investigated for the presence of consanguinity. Detailed family history and personal history were collected in the cleft center by the nurse coordinator or oral and maxillofacial surgeon. The patients' demography varied widely from states such as Andhra Pradesh, Karnataka, Maharashtra, Bihar, Orissa, Madhya Pradesh, Tamil Nadu, and Chhattisgarh. Few patients were even from other states such as West Bengal, Gujarat, and Uttar Pradesh. A total of 3653 patients' case records were identified where the presence of consanguinity of the patients' parents was noted. These medical records were separated and evaluated further. Then, the data related to gender, religion, age of the parents at the time of conception, socioeconomic status, type of cleft, degree of consanguinity, and presence or absence of positive family history were collected from these 3653 patients records and entered in Microsoft Excel. The data collected were then coded for facilitating statistical analysis. The Statistical Package for the Social Science version 16 (SPSS Inc., Chicago, IL) was used in the study. Data were analyzed through descriptive and inferential statistics. Chi-square test was used to compare between two qualitative variables. P < 0.05 was considered as statistically significant in the present study. A total of 3653 (20.02%) of the total 18,242 cleft patients showed consanguinity of their parents [Figure 1]. 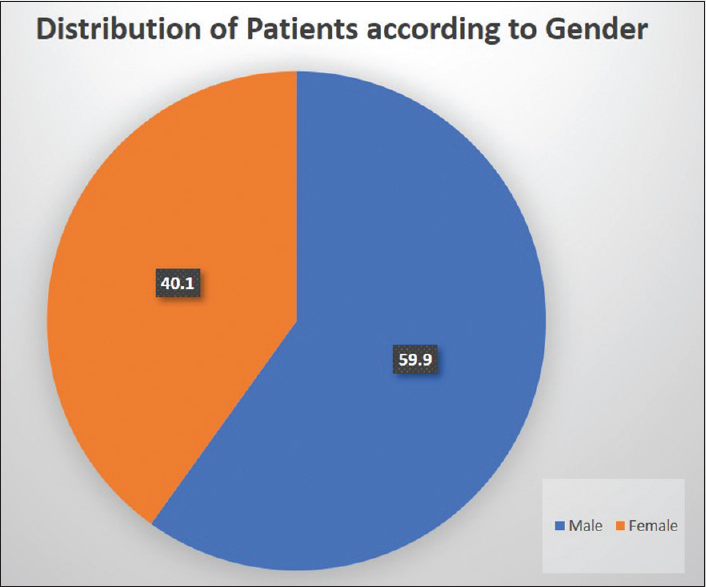 [Figure 2] represents the distribution of study participants according to gender. [Table 1] represents the distribution of patients according to religion. [Table 2] represents the distribution of patients according to parents' annual income. 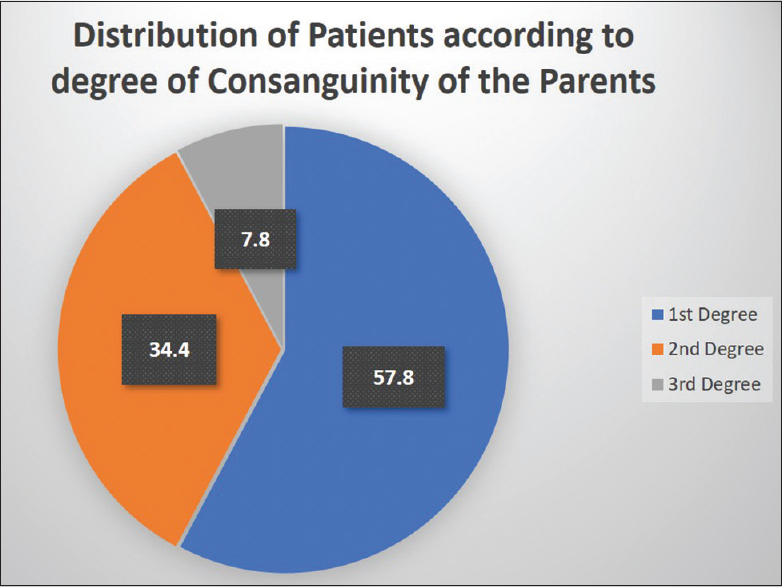 [Figure 3] represents the pie chart showing the distribution of patients according to the degree of consanguinity of the parents. 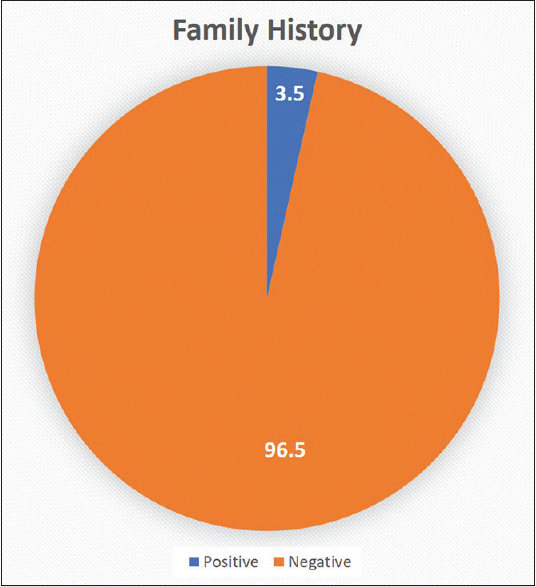 [Figure 4] shows the distribution of patients according to the family history of CLP. About 3.5% of the patients showed a positive family history for clefts. [Table 3] represents the distribution of study participants according to variations in CL, alveolus, and hard palate. 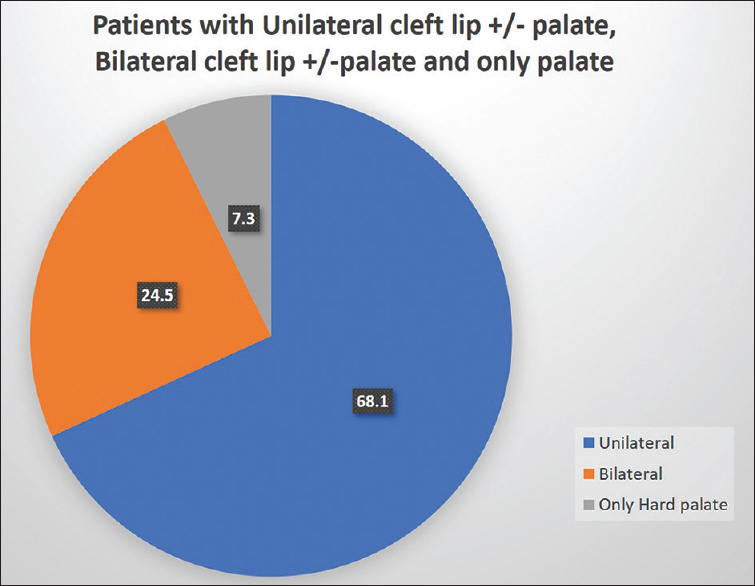 [Figure 5] represents the percentage of patients with CLP whereas [Figure 6] represents the percentage of patients with unilateral CL with or without palate, bilateral CL with or without palate, and only palate. The distribution of study participants according to variations in CL and degree of consanguinity showed no statistical significance (P = 0.773). The variations in cleft alveolus and degree of consanguinity also showed no statistical significance (P = 0.984). When the cleft of hard palate and degree of consanguinity was tested for any association, it was found that there was no statistical significance (P = 0.081). However, when cleft soft palate and degree of consanguinity were tested, statistical significance was present (P = 0.032). The distribution of study participants according to variations in CL and family history showed no statistical significance (P = 0.231), and variations in cleft alveolus and family history also showed no statistical significance (P = 0.084). However, the variations in cleft hard palate and family history and cleft soft palate and family history showed statistical significance (P = 0.007 for hard palate and P = 0.008 for soft palate). On comparison of parents' age at the time of conception in study participants with CL, there was no statistical significance (P = 0.841) for fathers' age whereas it was significant for mothers' age (P = 0.029). On comparison of parents' age at the time of conception in study participants with CP, there was no statistical significance for both fathers' age (P = 0.74) and mothers' age (P = 0.49). When the distribution of study participants according to variations in CL and gender and in CP and gender was analyzed, it was found to be statistically significant for both CL and CP (P < 0.001). Orofacial clefting is among the most common of all congenital disorders in humans, which has a genetically complex etiology. Based on embryological and epidemiological data, the phenotype can be differentiated into nonsyndromic CL with or without CP (NSCL/P) and nonsyndromic CP only, with NSCL/P being the most frequent form. In a study conducted by Sah and Powar, the authors found that clefts were more frequent among male population. Studies conducted in Dehradun, Brazil, Kenya, Iran,, and Saudi Arabia showed a male predominance. A study conducted in BPKIHS, Dharan, Nepal, presented that clefts were more common among females (56% females and 44% males). In the present study, approximately 60% of the clefts born to consanguineous parents were seen in males. The findings of the present study are similar to the majority of the studies quoted above. In a previous study, it was found that most of the cleft case families (54.6%) had an income of less than Rs. 5000/month. A study in Dehradun found that 82.38% of cases had family income of below Rs. 3000/month. In the present study, the annual income of consanguineous parents for whom cleft children were born was <50,000 (4166/month) in 91.3% of the cases. In a hospital-based study done in a tertiary hospital in Dehradun, 48.9% of cases had consanguineous marriage. However, in the present study, the consanguinity was positive in around 20.02%. The difference in the percentage of consanguinity was less in our study. In that study, 4657 cleft patients over a period of 5 years were analyzed, whereas in the present study, 18242 patients were analyzed in 13 years retrospectively from a high-volume cleft center. In a study conducted in Chennai, 33.3% of cases had consanguineous marriage. In studies conducted in Saudi Arabia, Pakistan, and Iran, the consanguinity was 54.4%, 61.6%, and 30.5%, respectively. These findings definitely show that there is a substantial association between consanguineous marriage and cleft anomalies. The results of our study showed more occurrence of clefts in people born to parents of the first degree of consanguinity. In the present study, the frequency of CL only was more than CLP than only the CP. These findings were different from the findings of studies conducted in Brazil, Iran, Jordan (CLP > CL > CP).,, In a study conducted in Japan, it was revealed that the order of decreasing frequency of the clefts was CLP > CP > CL, whereas in the Republic of Korea, it was CP > CL > CLP (CLP-Cleft Lip and Palate, CL-Only Cleft Lip, CP- Only Cleft palate). These findings show that there is a demographic variation in the frequency of different phenotypes. In the present study, 3.5% had a family history of some or other types of cleft phenotype. In a study conducted on 540 children to analyze family incidence of clefts, it was found that in 17% of children with CL and/or CP, a positive family history was found. In a survey of the patients with CLP in China who were funded for surgery by the Smile Train Program from 2000 to 2002, history of family members having clefts occurred in 6.84% of patients. Heredity increases the risk of clefts in newborns. In a population-based case–control study of live births in Kosovo from 1996 to 2005 using a regression analysis, it was found that the odds ratio was 8.25 at 95% confidence interval for clefts. In a cross-sectional study on 159 patients of CL and CP in Pakistan from November 2010 to December 2011, 21.4% of cases out of the total study population had a positive family history of cleft deformities. All the above studies showed that there is a definite influence of consanguinity in the occurrence of clefts as it is suggested that this association is probably related with a recessive genetic component and environmental factors. The present retrospective study from a very high-volume cleft center has shown that consanguinity is a major etiological factor in Cleft Lip and/or Palate. Reddy SG, Reddy RR, Bronkhorst EM, Prasad R, Ettema AM, Sailer HF, et al. Incidence of cleft lip and palate in the state of Andhra Pradesh, South India. Indian J Plast Surg 2010;43:184-9. Aquino SN, Paranaíba LM, Martelli DR, Swerts MS, Barros LM, Bonan PR, et al. Study of patients with cleft lip and palate with consanguineous parents. Braz J Otorhinolaryngol 2011;77:19-23. Schutte BC, Murray JC. The many faces and factors of orofacial clefts. Hum Mol Genet 1999;8:1853-9. Balgir RS. Dermatoglyphic features in congenital cleft lip and cleft palate anomalies. J Indian Med Assoc 1986;84:369-72. Murthy J, Bhaskar L. Current concepts in genetics of nonsyndromic clefts. Indian J Plast Surg 2009;42:68-81. Chung KC, Kowalski CP, Kim HM, Buchman SR. Maternal cigarette smoking during pregnancy and the risk of having a child with cleft lip/palate. Plast Reconstr Surg 2000;105:485-91. Consanguinity. Dorland's Medical Dictionary for Health Consumers; 2007. Available from: http://www.medicaldictionary.thefreedictionary.com/consanguinity. [Last retrieved on 2018 Nov 08]. Sah RK, Powar R. Epidemiological profile of cleft lip and palate patients attending tertiary care hospital and medical research centre, Belgaum, Karnataka – A hospital-based study. IOSR Journal of Dental and Medical Sciences 2014;13:78-81. Dvivedi J, Dvivedi S. A clinical and demographic profile of the cleft lip and palate in sub-Himalayan India: A hospital-based study. Indian J Plast Surg 2012;45:115-20. Menezes LM, Rizzatto SM, Azeredo F, Vargas DA. Characteristics and distribution of dental anomalies in a Brazilian cleft population. Rev Odont Sci 2010;25:137-41. Onyango JF, Noah S. Pattern of clefts of the lip and palate managed over a three year period at a Nairobi hospital in Kenya. East Afr Med J 2005;82:649-51. Jalili D, Fathi M, Jalili C. Frequency of cleft lip and palate among live births in Akbar Abadi hospital. Acta Med Iran 2012;50:704-6. Yazdee AK, Saedi B, Sazegar AA, Mehdipour P. Epidemiological aspects of cleft lip and palate in Iran. Acta Med Iran 2011;49:54-8. Al-Balkhi KM. The distribution and classification of clefts in patients attending a cleft lip and palate clinic in Riyadh, Saudi Arabia. Saudi Med J 2008;29:739-42. Singh VP, Sharma JN, Roy DK, Roy RK. A study of orofacial clefts seen in a tertiary referral hospital in Nepal. Ceylon Med J 2012;57:84-5. Rajesh P, Rajesh R, Narayanan V, Baig MF, Prabhu VR, Venkatesan A, et al. A clinical profile to assess the potential risk factors for cleft lip and palate. J Indian Soc Pedod Prev Dent 2000;18:147-50. Aljohar A, Ravichandran K, Subhani S. Pattern of cleft lip and palate in hospital-based population in Saudi Arabia: Retrospective study. Cleft Palate Craniofac J 2008;45:592-6. Khan M, Ullah H, Naz S, Ullah T, Khan H, Tahir M, et al. Patterns of cleft lip and cleft palate in Northern Pakistan. Arch Clin Exp Surg 2012;1:63-70. Al Omari F, Al-Omari IK. Cleft lip and palate in Jordan: Birth prevalence rate. Cleft Palate Craniofac J 2004;41:609-12. Nagase Y, Natsume N, Kato T, Hayakawa T. Epidemiological analysis of cleft lip and/or palate by cleft pattern. J Maxillofac Oral Surg 2010;9:389-95. Kim S, Kim WJ, Oh C, Kim JC. Cleft lip and palate incidence among the live births in the republic of Korea. J Korean Med Sci 2002;17:49-52. Zhou QJ, Shi B, Shi ZD, Zheng Q, Wang Y. Survey of the patients with cleft lip and palate in China who were funded for surgery by the smile train program from 2000 to 2002. Chin Med J (Engl) 2006;119:1695-700.